In 1972, the United States Environmental Protection Agency banned the use of the pesticide DDT, a known carcinogen. But the effects of widespread DDT use before the ban may still linger today. Now, a new study finds that women who were exposed to the chemical in the womb or in infancy — periods of high developmental growth — have a increased risk of developing breast cancer. The degree of increased risk depended on the amount of exposure to the chemical and age of initial exposure. The findings are based on research involving three generations of women in the San Francisco Bay Area. Women who had been exposed to high levels of DDT during these periods were usually diagnosed with breast cancer about 40 years after their initial exposure. “Nearly everyone alive has been exposed to this very persistent chemical, particularly women currently being diagnosed with breast cancer through early post-menopause who were alive in the 1950s and 1960s before DDT was banned in many countries,” study author Barbara Cohn, Director of Health and Development Studies at the Public Health Institute in Berkeley, California told Reuters. According to the CDC, people are most likely to be exposed to really small doses of DDT, or to the toxic chemical in DDT called DDE, through their food– meat, fish and dairy products. “What [researchers] found, was even those who had exposure at infancy or in utero had an increased risk. There is an interplay between exposure during in utero, during infancy, and a person’s own genomic makeup, and all of this may lead to cancers, especially cancers that are hormonally sensitive like breast cancer,” Dr. Lydia Schapira, Associate Professor of Oncology at the Stanford University Medical Center tells SurvivorNet. And what we learn from that, accord to Dr. Schapira, is that periods of hormonal growth are really important when your talking about environmental factors for cancer. “Exposures to toxic agents during very crucial times of development such as fetal development and infancy matter in terms of subsequent cancer risk,” says Dr. Schapira. 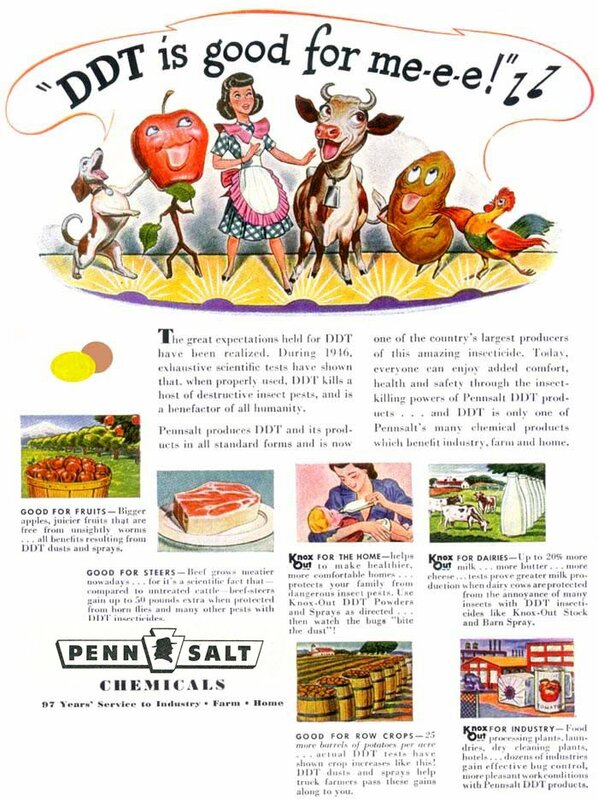 1947 advertisement for DDT, displaying the many possibly ways to use the product. Since 1996, the Food and Drug Administration has been part of an international effort to control DDT and other substances like it. At that time, countries joined together to ban and restrict a group of harmful chemicals, called Persistent Organic Pollutants, and DDT was in that group. In 2006, the World Health Organization declared that DDT was alright for use in some African Countries to control mosquitos that spread malaria. In the United States, the study probably won’t have a direct impact on contemporary public health, according to Dr. Schapira. “I don’t think it is going to inform public health (regulations) today, because we know DDT is a carcinogen and it has already been banned,” she says. But it does indicate that environmental factors for cancer are worth studying, and can have an impact that isn’t clear until long after exposure. “But what it does do is tell us how important rigorous work is to help us understand that environmental factors can disturb normal homeostasis and have long term effects,” says Dr. Schapira. Is DDT completely to blame? It isn’t possible to pinpoint DDT completely for cancer risk in any set of people, according to Dr. Schapira. “Its never 100% right in terms of assigning blame for a cancer, to name one specific thing. It’s usually an interplay between many things,” she says. “The association between exposure and cancer risk is strong, and it may be modulated or mitigated by genomic factors, and the authors acknowledge that,” says Dr. Schapira.